The hurricane season has barely started, and the first monster hurricane is already upon us — as Hurricane Florence rapidly approaches the East Coast, it is expected to lead to significant material damage. Financial markets are pretty good bell-weathers on which industries will be hit hardest, with certain stocks sliding in advance of the storm making landfall. Indeed, Bloomberg reported earlier today on insurance stocks taking a battering, regional utility companies taking a hit, and firms with significant presence in the storm cone of Hurricane Florence (retail, banking, etc.) going down. 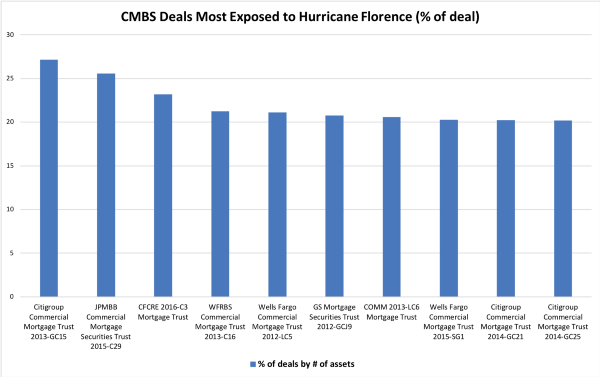 To better understand the exposure of the commercial real estate sector to storm and flood risk from Hurricane Florence, we analyzed the assets owned by real estate investment trusts (REITs) and assets that are collateral for loans bundled into commercial mortgage-backed securities (CMBS). For context: REITs own 42,924 assets across the U.S., representing 6.2 billion sq.ft. of space (the REIT universe is based on the U.S. universe of the FTSE EPRA Nareit Developed index, the main REIT index used by REIT ETFs and REIT investors). Since 2012 (the start of the CMBS 2.0 era), more than 24,000 properties and loans have been bundled into CMBS deals, with a total appraised value (for what it’s worth) of more than USD500 billion (note that one building can be securitized into multiple CMBS deals, and that appraised values are missing for about 13% of the properties/loans). The National Ocean and Atmospheric Agency (NOAA) provides forecasts of the “storm cone” of Hurricane Florence as well as other areas with expected storm surges. Of course, these geographic boundaries are shifting on an on-going basis — we used the polygons as of September 12 at 8am ET. 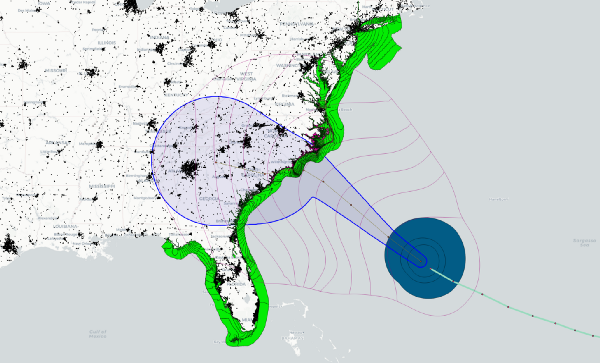 The maps below show the overlay of CMBS assets (left), REIT assets (right), and the NOAA-based storm path of Hurricane Florence, as well as storm surge areas. Some major urban areas are included in the current zone forecasted to be impacted by the storm, areas where almost all REITs own assets and where many CMBS loans have collateral. 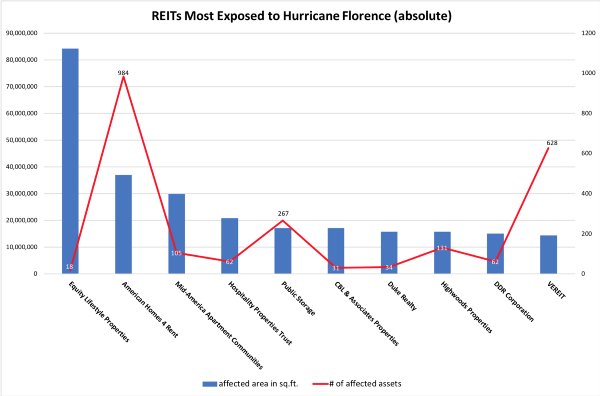 In total, 94 out of 130 REITs are expected to be affected by Hurricane Florence, with some 5,545 assets (545,235,430 sq.ft.) in the storm area. 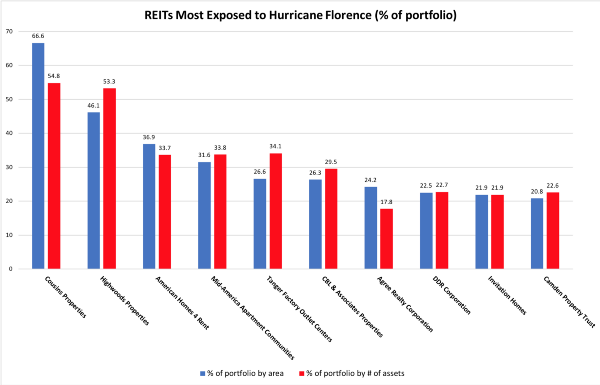 REITs with the highest exposure include Cousins Properties (NYSE: CUZ), with 67% of its portfolio in the hurricane zone, apartment giant Mid-America Apartment Communities (NYSE: MAA), with about a third of its portfolio in the storm cone, and Blackstone-backed Invitation Homes (NYSE: INVH), with more than a fifth of its portfolio exposed. From an absolute perspective, REITs with a significant exposure include Equity Lifestyle Properties (NYSE: ELS), Public Storage (NYSE: PSA) and Duke Realty (NYSE: DRE). While investors stay attuned to daily news about interest rates, employment figures, and the latest on the continuing trade war saga, financial markets are less apt to reflect the pending impact that climate events may have on asset values. 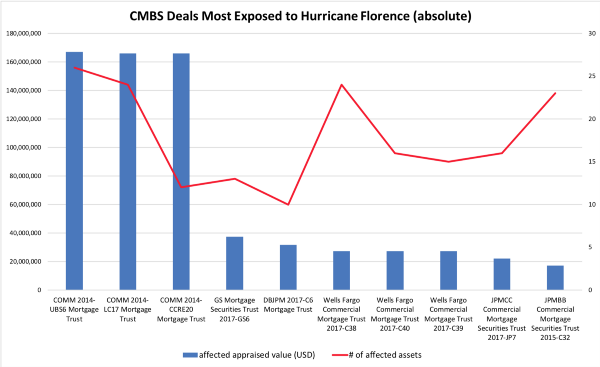 We believe that thus far, the street has failed to incorporate the clear and present danger of Hurricane Florence into the price of both REITs and CMBS deals that are (heavily) exposed. Time for a trade?